Tulips are a popular flower because they are long lasting and convey a variety of sentiments. 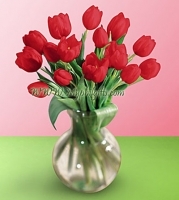 This bouquet features a 15 pcs bunch of tulips in a glass vase. Glass vase may vary.